Shed-style portico roofs feature a single, sloping surface. They are an excellent solution for homes with narrow front stoops. When installed above wide stoops, the overall aesthetics of the house may begin to look awkward so it is important to ensure the scale of both stoop and shed roof porticos are compatible. When you have space limitations such as overhangs, windows above the front door, or a tight stoop, a shed or flat roof may be your best option. These types of roof styles are the most affordable and often use a metal roof since the pitch is too shallow for shingles. The structure of shed-style porch roofs is relatively simple. Even though they typically cover a small area, they’re particularly effective at blocking sunlight and reducing temperatures both inside the home and within the area they cover. And there are important considerations, especially when comparing against other alternatives. Some folks consider fabric canopies but those can weather quickly, discolor and even rip. Metal canopies can have other limitations such as looking old-fashioned, disproportional and even convey stingy curb appeal. A shed roof portico yields important advantages over these old style types of awnings. Fixed shed roof porticos better protect front doors, are more stable and durable, longer lasting through the years and have considerably more curb appeal. 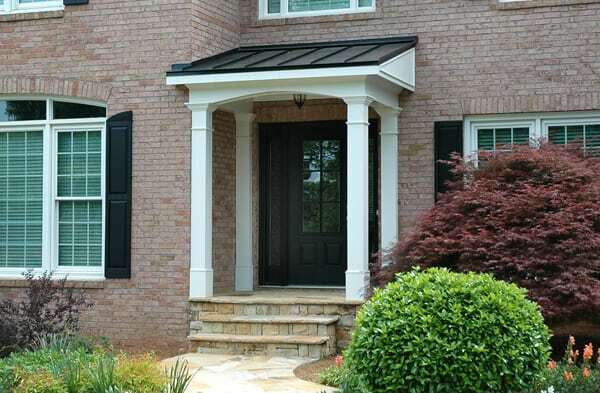 Similar to its sloped cousin, a flat roof portico adds understated beauty that appeals to the most budget-conscious homeowner. They have a semi-formal look (more so than a shed roof portico) and look very handsome on both stucco and traditional brick homes. We make sure your flat roof does not pool water by installing a rubber membrane during construction that is impenetrable by water. Once you’re decided on a flat roof portico, you might consider some additional features. An upper rail provides an instant balcony. Columns are another consideration whether rounded, square, Doric, Tuscan, or some other style. These are other details Georgia Front Porch can help you choose to further complement your residence. Flat roof porticos are simply elegant, architecturally appealing and most importantly, economical for you, the homeowner. If you’re interested in either a shed or flat roof portico, we can create photo renditions if you provide a straight, front view of your home. By the way, our customers love to see the photo-realistic options and agree they really do help select the most appealing design. This service is absolutely free! Let’s talk and discuss what might be the best design and features to fit your home and budget. Give us a call today for a no-hassle, free design consultation at 770-781-8234.